Facts about Pearl Gourami fish. "Scientific name for Pearl Gourami fish is Trichopodus leerii". Pearl Gourami fish is a native to the Southeastern part of Asia. It is mostly found in Malaysia, Indonesia and Thailand. 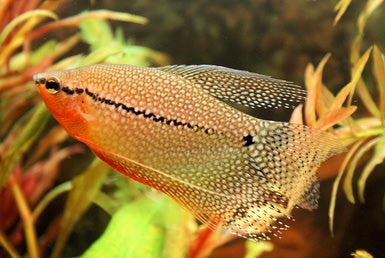 Some Pearl Gourami fish have also been seen in the islands of Borneo and Sumatra. You will find the Pearl Gourami fish in lowland swamps which have acidic water. While in the water, either the aquarium or their native aquatic habitat, they prefer staying at the top and the middle levels. Other names the Pearl Gourami fish go by is Lace Gourami, Diamond Gourami, Mosaic Gourami, Leeri Gourami. When fully grown, the Pearl Gourami fish attain a length of about 5 inches (12 cm). Their bodies have brownish silver colors and are covered in a pearl-like pattern hence their name. They have a backline that is conspicuous and runs from the caudal fin all the way to the head. Because of its patterns. They exhibit sexual dimorphism with the males being larger and colorful compared to the females. They also have an orange coloring around the throat which becomes brighter during breeding. The Pearl Gourami fish water temperatures ranging between 72 to 82 F° (22 and 28 C° degrees). They have labyrinth organ which functions well when exposed to fresh air periodically. Because of its timidity and shyness, you should avoid putting this fish together with other aggressive species. The Pearl Gourami fish are omnivores. As such, they can feed on virtually everything from frozen and dried foods to tubifex worms, brine shrimps and bloodworms. They build bubble nests which are supported by plants. The right temperature for spawning is about 82 F° (28 C° degrees) and a neutral pH. After the spawning, the males and females separate thereby allowing the eggs to hatch in about 2 days. When mating, the Pearl Gourami fish conduct a very unusual mating dance. As the males build the bubble nests, the females take a position under it. It is the male that takes responsibility over the fry to ensure that they are safe and secure in the bubble nests.